I have just taught myself how to knit..well trying to teach myself. Some of these stitches have been so easy to follow! I am so excited I know something besides the basic stitching. Thanks for sharing! 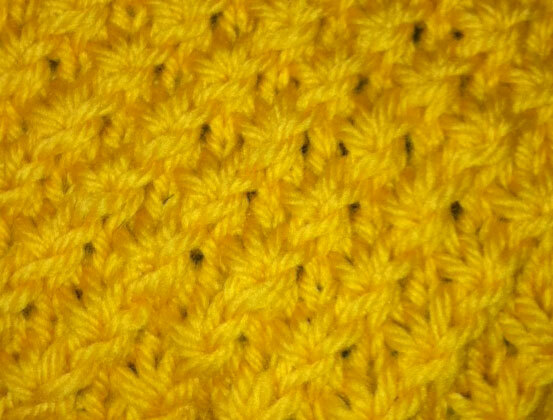 how many stitches do you start out with to follow this pattern? 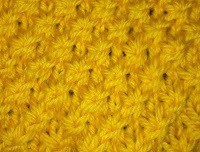 how to knit the star stitch in a round in order to knit a hat? My English is no good ,hope you know that what I mean! Rather than me trying to explain, here is a good article on converting stitch patterns for using them in the round. Hope this helps! Thanks so much! Your explanations are so clear and your patience to teach is so great! I really loved to knit the star stitch. in the written pattern it says to knit 3 together, but in the video its showing purl 3 together , which do you do? You're reading the instructions for the stitch in the round, where they are knit. If you read the instructions for working the stitch flat, it says purl, and the video shows the flat version. At the end of round 4 after you slip the stitch and place the marker back into position do you then slip back the third stitch from the star that is on the left needle onto the right-hand needle and then knit a row 1 from there skipping the 1st stitch? Or do you keep it on the left needle and reknit the one that you just created so your new row 1 has every stitch knitted?